Universal fire suppressant that is saving lives and property all over the world. It will extinguish class A & B D and K fires. Including grass and brush, cars, tires, metals, hydrocarbons gas and diesel and polar solvents like acetone an ethanol. Portable, personal fire suppression system used to replace standard dry chemical unit. Unlike other fire fighting materials, which may mask the evidence, Cold Fire will not influence the investigation scene of suspected arson. It also has been noted that the olfactory faculties of animals normally used in the investigations are not affected by the use of Cold Fire. NFPA 13 & 18 2006 Tested. HMIS Rating of 0, 0, 0 (same as water) making it NON-hazardous and safe to handle and apply. Nor does not harm the environment, firefighters or fire victims. Can be sprayed directly onto a fire victim and its cooling properties will allow a fast, potentially live-saving medical response. Considered an acceptable non-toxic substitute to Halon and toxic foams. Costs only cents to treat a gallon of water. Does not crystallize, gel, separate or go bad when stored in sealed containers. Indefinite shelf life. 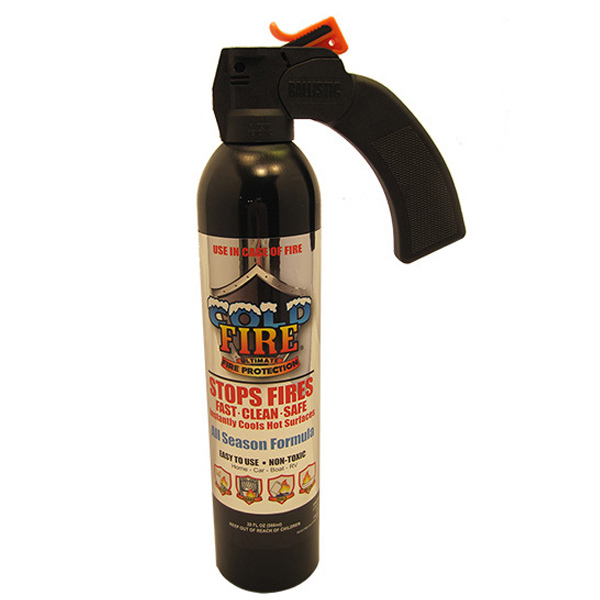 Cold Fire can be used as the primary fire-fighting agent and structure protection unlike gels.